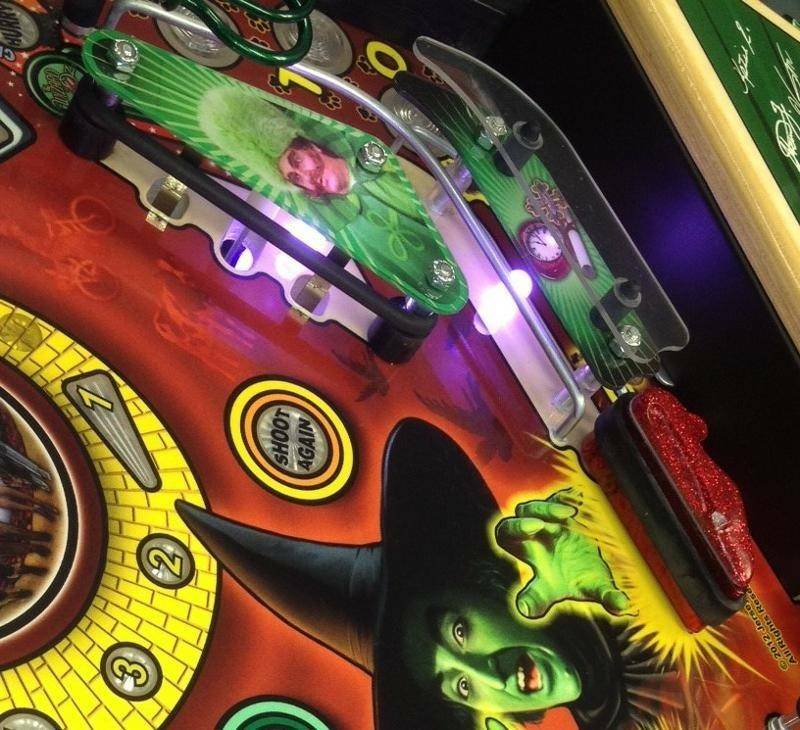 Jersey Jack brings the Wizard of Oz pinball machine into the 21st Century, with a ground breaking LCD Monitor that immerses players with visual scenes, ever-changing animations, videos and players scores, plus its larger „wide-body“ style playfield that comes with special multicoloured LED Playfield, Cabinet and Topper Lighting, which amazingly cycles all lights in 1000’s of different colours combinations constantly during gameplay, which will surely mesmerize both players and spectators alike ! 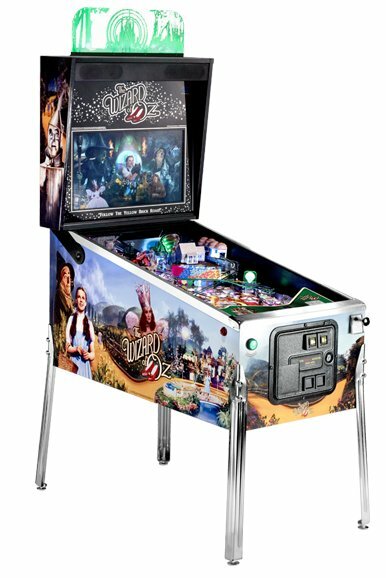 The Wizard Of Oz pinball machine is loaded with action on (3) separate playfields, and includes hand-drawn playfield, full color cabinet and backbox artwork, (4) Mechanical Toys like Dorothy’s Spinning House, Witch’s Castle, Flying Monkey + Melting Witch, plus (5) Flippers, (2) Mini Playfields, (3) Trumper-Bumpers, (1) Balloon Bumper, (5) Playfield Ball Magnets, (1) Spinning Target, Rollover Targets and Winkie-Guard Drop Target, plus its very unique “Crystal Ball“ with Embedded LCD Display! 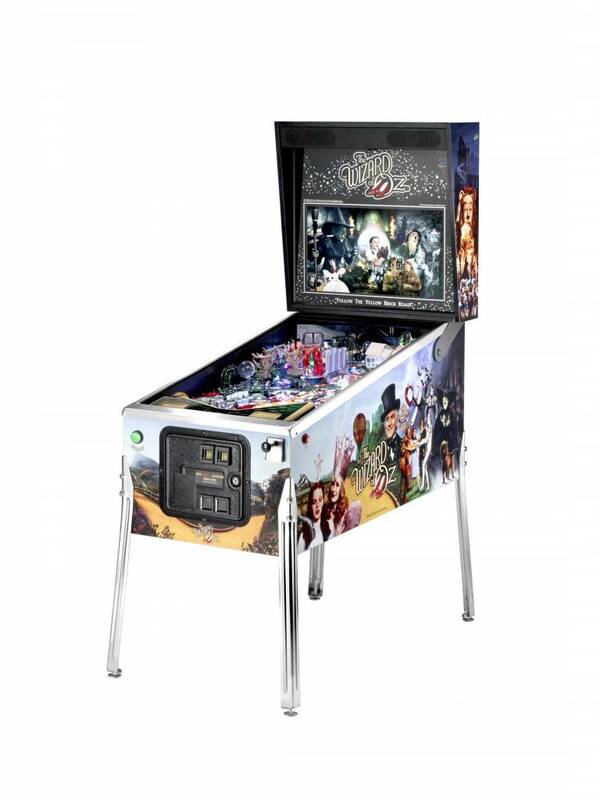 The Wizard of Oz Pinball also is equipped with a powerful Digital Stereo Sound System which booms out the original soundtrack music scores, speech and special effects. Hand drawn playfield, plastic set, decal set by artist Greg Freres. Four major mechanical toys; Dorothy’s Spinning House, the Witch’s Castle, Flying Monkey, Melting Witch. Five flippers, Two mini play fields, three Trumper-Bumpers, one Balloon Bumper, Five magnets, One Spinning target, Crystal Ball, Rollover targets, Winkie Guard drop target. Full colour cabinet and backbox artwork created by artist Jerry VanderStelt. Art will be screened on the highest grade adhesive backed vinyl and printed with UV stabilized inks. Digital Stereo sound system which will boom the music and effects created by SoundMaster, Chris Granner. Front of game audio connection jack for headphone/ear bud. Component audio connection jack at rear of game. 26″ LCD HD-Quality monitor which will display scores, animation, movie clips, attract mode, backglass artwork and more.